Bipolar neurons have 2 processes - axonal and dendritic. They have 2 distinct structures to carry out these processes. These neurons are chiefly involved in transporting electrical signals from the peripheral nervous system to the central nervous system. The speed of electrical signals fired from a neuron can reach speeds of up to 200 miles per hour. Neurons, also known as nerve cells, transmit and receive information in the form of electrical signals to and from the brain and the nervous system. A neuron is made up of 3 main parts: cell body (or soma), dendrites that branch out from the soma and look like a tree and receive signals, and the axon, a single long, tubular structure that sends electrical signals to the neighboring neurons. Depending on the number of extensions, neurons can be classified as unipolar, bipolar or multipolar. Unipolar neurons do not have a separate dendrite and axon. They have just one single structure that branches out from the soma and transmits and receives signals. The axonal and the dendritic process are fused together and they form a single, non-separate process in unipolar neurons. 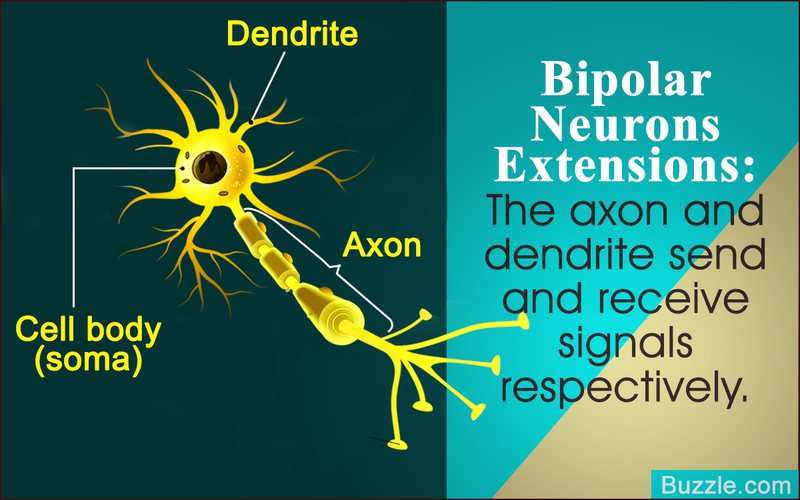 Bipolar neurons, on the other hand, have two separate processes that help us to identify the axon and dendrites. Unlike unipolar neurons in which the axon and dendrite are merged together, bipolar neurons have two distinct structures that serve as axon and dendrite, respectively. There are two different exits from the soma (cell body). Also referred to as cytoplasmic extensions, these structures also have smaller branches that finally terminate at nerve endings. In some cases, dendritic branching is so large and intricate that the bipolar neuron is capable of receiving 100,000 signals. As far as movement of electrical signals is concerned, in dendrite, the signal runs in the direction of the body cell, whereas in axon, the signal moves away from the body cell towards the brain. The proper working of axon and dendrites is extremely important for the neuron to transmit and receive signals efficiently. Quite a few sensory neurons that convey environmental information, such as smell, light, touch, and sound, to the spinal cord and the brain, are bipolar. For instance, those located in the skin use their one extension (dendrite) to detect the sensation of touch, while the other extension (axon) is used to convey the stimuli detected in the skin to the spinal cord and subsequently to the brain. The sensory neurons are essentially located in the peripheral nervous system. Their main job is to relay sensations from peripheral areas of the body to the central nervous system. The neurons located in the retina is another example of bipolar neurons. They collect vision signals from the retina of the eye and transmit them to the brain. Bipolar neurons are also located in the roof of each nasal cavity and are able to distinguish between a range of odors. Whereas, cochlea, the auditory system in the inner ear, also has bipolar neurons. To be more specific, the cochlear nerve is essentially made up of bipolar cell bodies. All in all, these bipolar sensory neurons play a crucial role in the functioning of sense of smell, sight, taste, and hearing. Bipolar neurons are also the functional units of the vestibular system, which plays an important role in maintaining our balance. This vestibular system that is made of vestibular receptors, nerves, and ganglion, are also present in the inner ear and convey sensory data to the brain, which contributes in maintaining upright posture and coordinating head and eye movement.